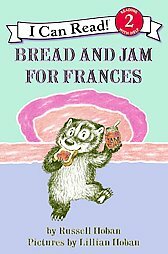 I remember falling in love with "Bread and Jam for Frances" when I was a child and I was eager to see if my 3 year-old daughter would be equally fond of it. It's one of her favorites. We've read this book before bedtime almost every night for the past month. When fussy eater Frances refuses to try anything new to eat, her mom and dad teach her a loving lesson in how you can have too much of a good thing. 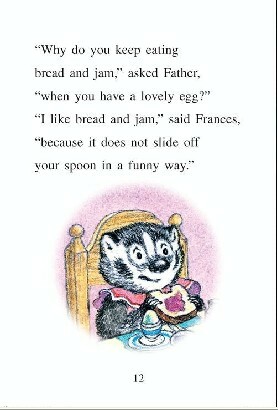 My daughter likes pointing out all the different food that's represented in Lillian Hoban's wonderful illustration and she's memorized all of Frances's charming little songs about jam and food. 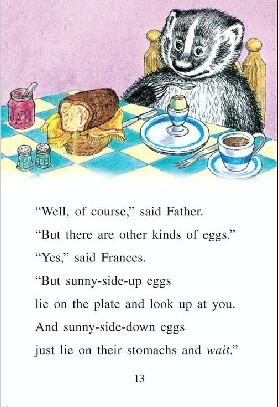 The love, humor and gentle nature of this book make it a good one to pass down from generation to generation.